A cold wind can steal body heat fast, so it’s important to have a layer at hand to block wind’s chilling effect. But what’s the difference between a wind-proof and wind-resistant fabric? And what are the relative pros and cons of each? The first half of this is easy. Wind-proof means that the fabric is just that—impervious to wind, no matter how hard it may blow. Fleece and soft shell garments made with Gore Windstopper are good examples of this genre (though many manufacturers offer their own proprietary versions of wind-proof fabrics). It’s when you get into what exactly “wind-resistant” means that things get tricky. There are no hard and fast industry rules here that determine when this term can be applied to fabrics, which is why you see it used a lot on clothing labels and specs. But there’s an easy way to test this. Simply hold the fabric against your mouth and blow against it as hard as you can. An average adult can generate a maximum pressure of approximately 2 pounds per square inch this way, which is roughly the equivalent of a 20 mph wind. If you can feel your breath coming through the fabric (or not), you thus have a good gauge for its effectiveness. Likewise if your breath passes through easily (low wind-resistance) or with difficulty (moderate wind-resistance). 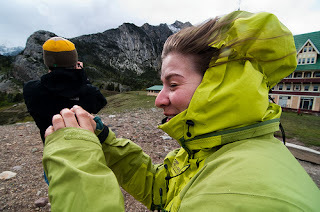 In my experience, most wind-resistant materials are adequate for about a 10 to 15 mph breeze, though please note that the above numbers are just very rough approximations at sea level, and that actual wind pressure can vary substantially depending on elevation and temperature (less dense air = less pressure for any given wind speed = greater wind-resistance for any fabric). So, given the choice, why wouldn’t you just go with a wind-proof fabric every time? Two reasons. First, as a general rule, the more wind-resistant a fabric is, the less breathable it becomes. This can result in substantial sweating, especially if you’re active in a wind-proof jacket, and doubly so if you’re wearing a wind-proof layer under a Gore-Tex jacket. Second, the more wind-resistant, the more the fabric muffles sound. Obviously this only has implications for your head. Hats with full wind protection over the ears do offer maximum protection for these exposed pieces, but they also markedly dampen sound and can make communication more difficult, especially in an already windy and noisy environment.